Resonance Path Institute faculty Spring Cheng, Joe Shirley, Chris Clark and Joseph Friedman were invited this summer to participate in the first ever global online We-Space Summit. 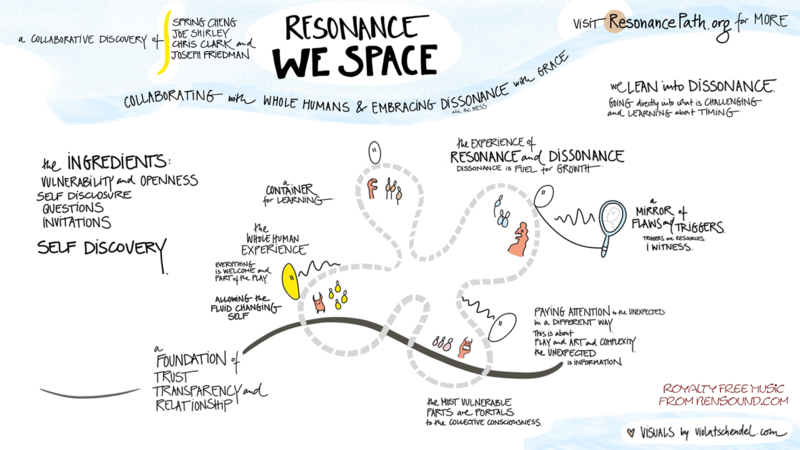 Over the last several months we met to articulate the emerging principles of Resonance We-Space. As our entry to the Summit, we prepared a documentary of our process, illustrating the application of our principles we outline. On October 12, our video will streamed for free at the We-Space Summit website. new inroads into leading-edge Collective Practice. will be presented on October 12! This project started out in the standard We-Space Summit Zoom format, though the participants soon realized that in order to capture and share the unfolding process and discoveries in a way that could do justice to the process, they added a layer of storytelling that in the end, produced a wholly unexpected yet remarkable video documentary on their work in the We-Space. Watch the faculty members of Resonance Path Institute including Joe Shirley, Spring Cheng, Chris Clark and Joseph Friedman ride the waves of deeper creative emergence as they present the framework and practices of Resonance We-Space. In this video, the core team introduces two fundamental practices, Embracing Individual We Space and Dancing with Dissonance. Their term Individual We-Space honors the changing, fluid multiplicity within each person and our inborn ability to reflect the collective experience as an individualized fractal representation within the larger collectives we are an integral part of. Dancing with Dissonance is a new, experiential model of co-creative collaboration inspired by improvisational dance. It maximally transforms the energy of dissonance into creativity. Join them as they journey into these powerful frontiers in the We-Space. Let us help cultivate Resonance We-Space in your organization or community. Learn more on the Resonance We-Space Practices page.